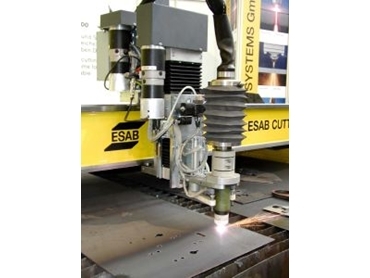 THE latest range of plasma cutting machines from ESAB, represented by Headland Machinery , uses new production technologies to improve material utilisation and increase plate handling efficiencies. The Eagle series of plasma cutting machines combines advanced precision mechanical engineering with recently developed super rapid initial height setting system (SRHISS) technology to increase both the speed and quality of cutting across a wide range of materials and plate sizes. The combination of additional speed and better material utilisation results in a new cutting solution that delivers the lowest possible unit cost for component production. A number of new developments come as standard that include the ESAB anti-collision system. With the Eagle, both the marking and the cutting operations share the same torch and only one electrode is needed on the plasma for the full thickness range. The cutting settings are adjusted automatically from an on board database which is controlled and monitored by a VisionPC controller. The introduction of these latest Eagle machines reinforces ESAB Cutting Systems' strength in offering complete and totally integrated turnkey solutions. These packages combine cutting machine, process expertise, numerical controller, programming, cutting table and filters to deliver simple to use, highly mechanised solutions. With a cutting width of up to three metres and incorporating automatic adjustment of cutting parameters according to plate thickness, the Eagle can operate at speeds of up to 35 metres a minute with high point to point acceleration. ESAB Eagle machines are designed to give a compact and uncomplicated appearance, but beneath this outward design-simplicity exists an advanced mechanical design solution that incorporates a transverse linear guiding system for increased stability and accuracy. The rails are positioned lower than the cutting table with a minimum space of 250mm between the table and the track to ensure an easy up/download of the work plate and cut parts. The VisionPC controller is freestanding to minimise space and the cutting torch is installed with an anti-collision system that allows complete removal of the head. This feature avoids the risk of impact damage and provides for the easy interchange of service parts by being able to remove the torch from its support. Different plate materials such as carbon steel, aluminium and stainless steel and of differing thickness can be cut in sequence whilst on the same table thanks to ESAB's numerical controller (with automatic database) and precision plasma source. For example, one press of the start button immediately initiates marking of the first plate, then switches to cutting mode before automatically moving to mark up the second plate and to repeating the cycle through to the third plate. Travel time is 35 metres a minute and, despite the varying thickness of the work plates, the height re-setting cycle time is less than two seconds for each plate.